Riverdale, once a thriving settlement on the banks of the Finley River. Its history goes back to 1819, when Henry Rowe Schoolcraft wrote in his journal on December 31, of seeing rolling plains and well-wooded bottom lands along the Finley. When Schoolcraft’s account of his exploration of the land between the White River and the James was published a wave of settlement began. The only other residents before 1830 were Delaware Indians. Around 1840, Benjamin H. Hooten (One the the original founders of Hootontown) built the first mill on the banks of the Finley at Riverdale. For most of the ensuing century a succession of owners operated that mill or others built on the site. 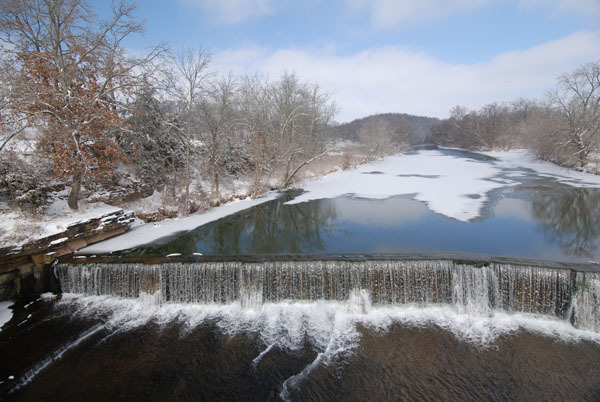 In 1867, a much-improved mill-dam was constructed across the river of hand-hewn hardwood logs. 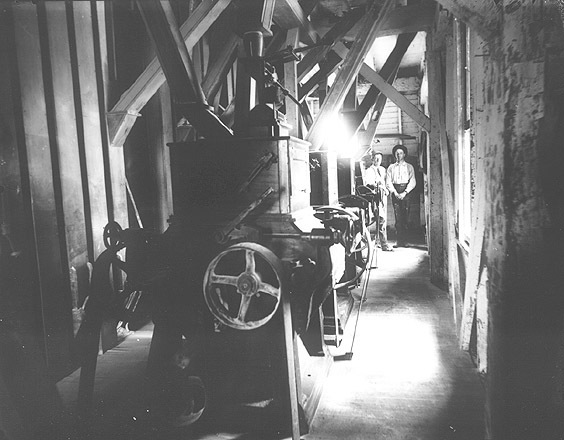 Changes in the mill itself culminated in the building of a three-story structure between 1891 and 1896. By then, the community included a post office in the general store, and the name Riverdale became official. 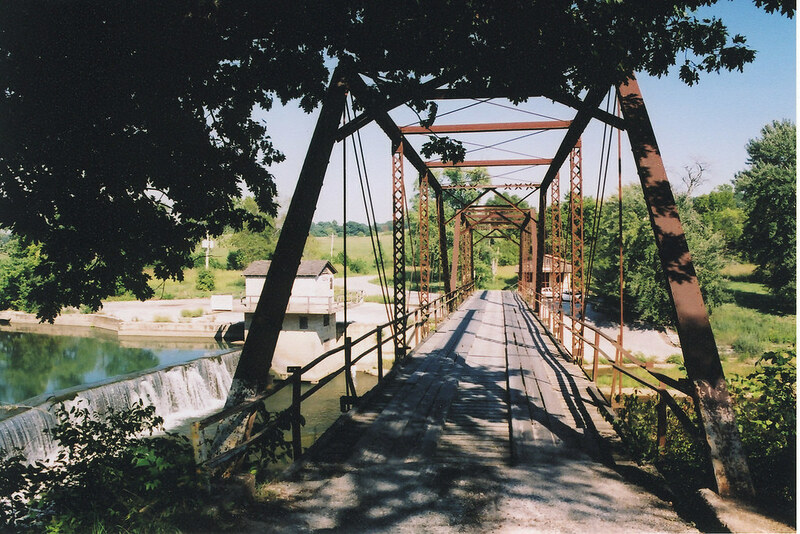 Wagons carried sacks of “White Rose Flour” from the Riverdale Mill to towns throughout the region, crossing the Finley via an iron truss bridge erected in 1906. 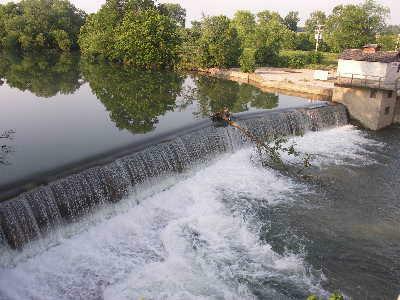 A little later, a concrete dam was built to replace the 1867 log dam. The bridge, raised and strengthened for flood resistance, and the dam are still functioning today. Riverdale’s importance as a milling center ended in 1926, however, when a fire broke out in the mill building and burned it to the ground. 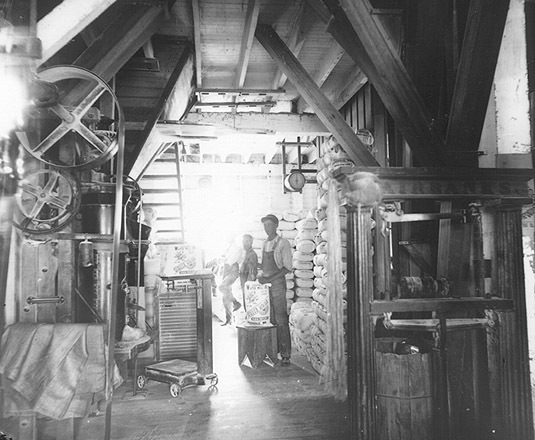 This ended the production of White Rose Flour, although a small gristmill was built fur local use. First attempts to promote tourism came in the 1930’s. Within the memory of many people alive today are the pleasures of swimming, camping, and picnicing at Riverdale. Early Riverdale community residents were the John Turners, who owned a nearby farm. There Ben Turner, their son, was born in 1896. A guest at Sunday’s meeting, Ben Turner had interesting tales to tell of growing up at Riverdale, where he still lives. Among his mates at the old one room schoolhouse were “Ma Barker’s Boys.” Even in their youth three of the four Barker boys showed the inclinations that involved them in violence and crime in later years. In 1982 the Turner family was deeply involved in the move to bring new life to Riverdale. In working on the old mill pond, they uncovered the ancient timbers of the early dam, underwater for 115 years but still worth salvaging. Also underwater was the 75 year old turbine that had been installed in 1906 in the mill by a Springfield, Ohio company. The Turners, seeking to put the turbine to use in generating electricity, sent the old machinery to Ohio for rebuilding. The manufacturers claim it will be as fine a water-powered small turbine as any they could supply to replace it. The plan is not only to use the Finley’s waters to generate electricity, but also to restore old buildings of Riverdale and possibly open a museum. Riverdale is reached via U. S. 160, by a gravel road branching off to the East about four miles South of Nixa. Old maps really tweak my interest, especially maps of the Ozarks in and around the White River area. I enjoy trying to find old roads, building foundations and imagine what it could have looked like when the long lost communities were in their prime. I especially am fond of traveling down 125 just to take the ferry at Peel, so I wondered if it would be possible to find out anything about the ferries that worked the White across what is now Table Rock Lake. After the Civil War, the first settlers of this area, aware that the railroad was about to arrive in Springfield, decided that it was time for the farm and product producing lands of the Ozarks to be connected to oncoming civilization by a road suitable for commercial transportation. They labored from dawn to dusk, tying many existing game and Indian trails together. For years they cleared, widened and leveled the rugged paths and created The Wilderness Road of the Ozarks. This rugged, but wonderfully usable route quickly became the lifeblood mainline of the area. Hundreds of freight wagons immediately began transporting farm produce and homemade items to Springfield, while the same returning wagons brought all the manufactured and mass produced goods essential to progress and increased production and a bit of domestic joy in life back down the Road to the farmlands. At every place where The Wilderness Road of the Ozarks crossed a well used Indian or game trail people camped out to await traders to accept their goods and sell them, or trade with them, for things they needed or badly desired to have. School children were employed to drive flocks of turkeys and herds of food animals up the Road, along the full length of Campbell Street, to the then brand new freight yards in North Springfield. Where the town of Kimberling City now stands once lay the Radical Campground, a place where as many as two hundred wagons would camp, awaiting the lowering of periodical flood waters in the mighty White River, in order that they might cross and proceed with their trade routes. 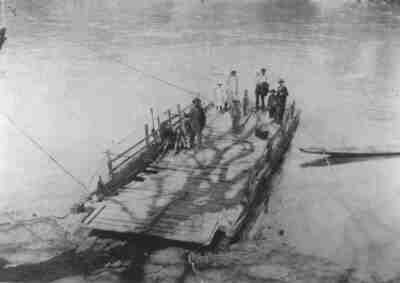 In time the Maybry Ferry was built to haul stock and wagons across the White in all but high flood times. Later it became the Kimberling Ferry and the town of Radical grew on the banks, by the ferry and lying on The Wilderness Road. In time the first metal bridge replaced the ferries. Now the roads, the ferries and the old steel bridge all lie beneath nearly two hundred feet of Table Rock Lake’s waters. Thus passed the many decades of years, and thus came inevitable progress. The perhaps “final note” of this is that all of these towns are still being served by The Wilderness Road routes some 150 years later, and probably will be served by the network of roads tied to The Wilderness Road for many decades to come. Because, you see, the Road is still there, its route pretty much as it was first built – though it has since been straightened, graded, graveled, widened and eventually paved to today’s standards. But the old routes lie there beneath the highways. Hundreds of freight wagons then, thousands of eighteen wheeled trucks now. Countless people on foot or horseback then, more than ten million people each year in autos and buses today. But – just as there was no other way to get from there to here in those days – so it is today. The Kimberlings came to settle on the south side of the White River, near a place called Maybry’s Ferry (actually Mayberry’s Ferry). The Kimberlings were led by the clan’s patriarch, Nathaniel Kimberling, with his Goodwife, Nancy. Nate was instrumental in beginning to consolidate and improve the Old Wilderness Road, a series of Indian and game paths. His son, W. W. Kimberling, and his friend, Joe Philibert, the very first permanent settler in the Ozarks, worked to see it being constructed from Berryville to Green Forest and then on to Springfield, by way of Maybry’s Ferry and Linchpin Campground, which is now Branson West. Using returning Civil War veterans, they worked to have it widened to permit team drawn wagons to use The Road. Thus began the first actual long-haul commerce in the Ozarks. One could stand anyplace on the Wilderness Road and see more than a hundred freight wagons a day pass that spot, every day, from dawn to dark. After the war, W.W. Kimberling and his wife Phoebe lived on the north side of the White River, right on the Old Wilderness Road, whose beginnings were hacked out by his father Nate. William and Phoebe had a general store in their home there in 1868, which was patronized by folks for miles around. William and his customers wanted a post office for his store and began plugging to get one. In 1874 a postal inspector was sent to meet with William and his brother-in-law Sam Stewart to discuss postal things, such as location, and a name for it. John Angel James Creswell (November 18, 1828 – December 23, 1891) was an American politician from Maryland. 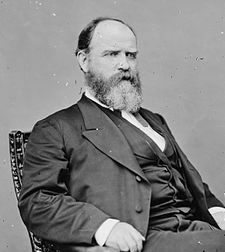 He served as Postmaster General of the United States during the Grant administration. Well, it seems that William, instead of Radical-Sam, ended up being the postmaster. The appointment read, “John J. Creswell, Postmaster General, on the 13th of January, 1874, appointed William W. Kimberling Postmaster at Mayberry’s Ferry. Executed 24th of January 1874 at Washington City.” And, though the appointment read “Mayberry’s Ferry,” the post-office, and subsequently the little town, was named Radical, just as the inspector said. It was officially recognized and entitled by that name on Missouri State maps and the U. S. Army Corps of Engineer maps drawn up for the design and building of Table Rock Lake. (See map, Missouri State Highway Dept., Stone Cy. Mo., 1950; Commercial Roads Across the Land of Taney 1870-1906, Ingenthron; Branson and Country Tributary, Lake Taneycomo, by the Branson Sentinel, 1914; also pertinent Corps maps, Table Rock Reservoir, 1944.) 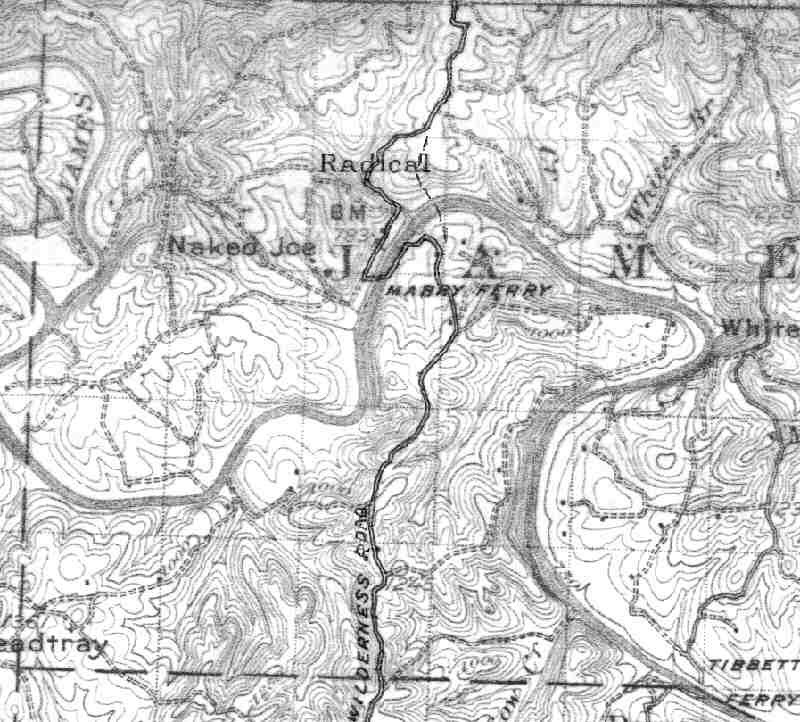 (The Corps maps are the only ones showing Radical on the south side of the White River. All the other maps, including the 1950 State Highway map, shows Radical where it actually was, on the north side of the White River.) In much later years, the “town” of Radical moved up and down Highway 13, as various homeowners took over the duties of the postmaster for the area. In 1870, W.W. Kimberling bought land on the south side of the White River and he and Henry Thomas bought the old Maybry (sometimes Mayberry) Ferry. It was so old and decrepit that they decided to build a new ferry. They freighted the materials from Green Forest and Springfield by wagons and four horse or four mule teams. The gunnels for the ferry came prebuilt from the West Coast and they were 42 feet long. The ferry ran on a steel cable and was powered across the river by being angled to the stream. The set of the angle determined which way and how fast the ferry ran. The location for the ferry was about a half mile upstream from the present existing bridge location. This was where the Wilderness Road crossed the White River. The Old Wilderness Road wound its way up the bluffs of the White River, and when it reached level ground, a branch of it passed through where the old Kimberling Super Market Building now stands. In 1999, the food market was converted and now is occupied by a large flea market and antique mall. The Sheppard Cemetery behind the market building was once just off to the east side of the Old Wilderness Road. Then the roads rejoined and wandered up the hills, past the still to be seen Nickerson log cabin in Kimberling Hills. When it reached the high ground it became a typical “ridge-runner,” once Highway 43, now known as Highway 13. It then passed through Linchpin Campground, (next called Lakeview, now Branson West) where most wagons stopped for the night. However, the campground at Radical was also quite popular, being right on the banks of the White River at the Mayberry/then Kimberling Ferry. Then The Wilderness Road went on up through Stutts (now Reeds Spring Junction), through Dutch Store (now Highlandville) where it joined the Springfield-Harrison Road, then on to Springfield, up Campbell Street, and finally ending at the railroad yards on the north side of town, a full two days’ hard drive with a team and wagon from the White River crossing at the ferries of Radical (now Kimberling City). Linchpin Campground was just beyond what is now called Branson West, and was earlier called Lakeview. The Ayres Advertising Building stands just to one side of the former overnight stop off place. A ragged wooden building stands near the center of the campground with a sign denoting Linchpin Campground on it. (That building is now part of a commercial development company’s offices and warehouse in Branson West). 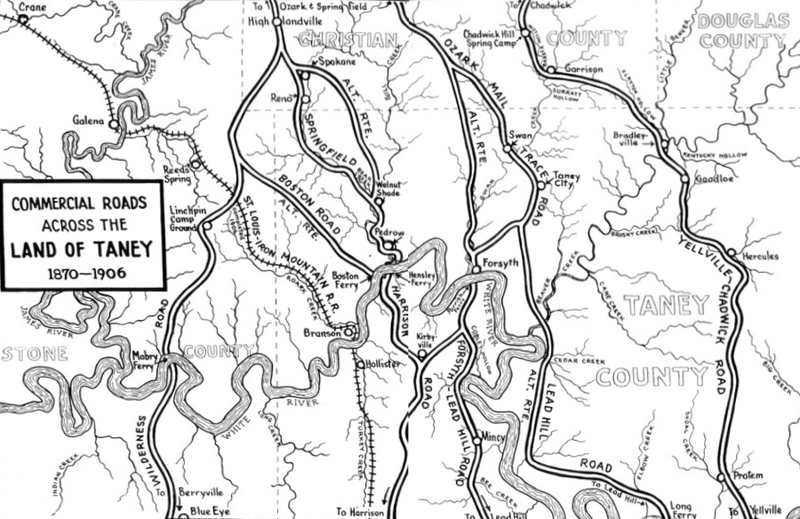 Most of the Kimberling City portion of the Old Wilderness Road may be traced out on the U. S. Army Corps of Engineers’ Table Rock Reservoir maps of 1944, and upon other Missouri and U. S. Highway maps of the time. Mr. and Mrs. Fred Kimberling are pictured on the occasion of their 61st wedding anniversary. The couple had just received a congratulatory note from President and Mrs. Richard Nixon. The photo is courtesy of Janet Thompson granddaughter of Mr. and Mrs. Fred Kimberling. Pictured is Fred Kimberling whose father was the namesake of Kimberling City in Stone County, Missouri. Fred is standing on the front steps of the family home which was built the year Fred was born. 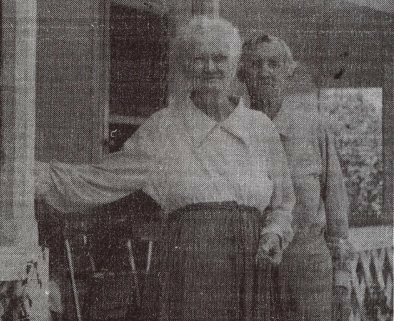 A newspaper article in which the picture appears states, “In the old days, when high water made river passage impossible, travelers camped in the yard of the home and Fred’s mother passed out homemade biscuits at 10 cents a dozen”. The photo of Fred Kimberling is courtesy of his granddaughter Janet Thompson. Fred Kimberling was born to William and Phoebe’s family November 1, 1884, in a little log house on the Kimberling property, on the south side, across the river from Radical. In the spring of 1885, William began building a fine new home on the hill overlooking the White and only fifty yards or so from the Old Wilderness Road. From the new home he could watch the operation of his ferry. The going rate for a wagon and team at that time was fifty cents. The family moved into the home in July 1885. William Kimberling’s ferry ran for 52 years, until December 10th, 1922, when it made its last run. The Crane Chronicle at that time documented it and said, “The old boat was hauled onto the banks of the river and its belly turned up to the sun, there to have its bones bleached by the elements and time.” A sad ending to a tradition on the White that ran for nearly a hundred years. 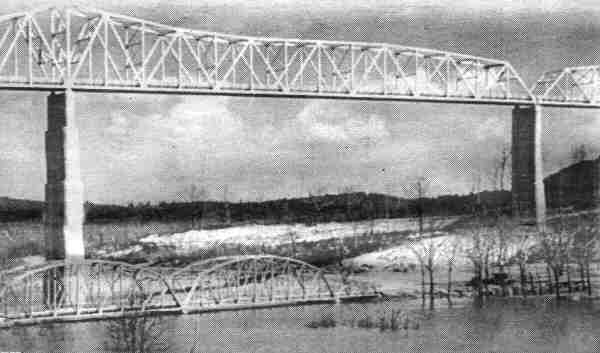 The new (the first) Kimberling Bridge and the new roadway being built by Stone County in 1921, was soon to replace the ferry. The bridge was the pride of the whole countryside. People came from miles around to watch the workmen. When the bridge was finally finished The Chronicle tells us that people came and parked all along its length. Every Sunday folks came in droves to take pictures, picnic in the grove or hang languidly over the rails to fish and visit. They were often so thickly parked that some feared the bridge would collapse, but it didn’t, not then. Photo shows the original bridge below the current bridge at Kimberling City before the lake was completed and it filled in 1957. The old bridge still stands in deep water as it flooded before they could remove it. In the spring of 1927, on April 16th or 17th, news quickly spread throughout Stone County that the new bridge had washed away. As it turned out, the always dangerous White River had struck once more. It had crested much higher than anyone thought it ever would and it took out about half of the bridge and carried the mass of steel some 300 feet down stream. The southern half of the county was cut off from the rest for quite some time. With the Kimberling (Mayberry) Ferry gone and half the bridge missing, freight and travelers were back to waiting for the river to be at its lowest and then fording the stream where it cut the Old Wilderness Road. Crews worked continuously during daylight hours and, on December 23, 1927, the bridge was reopened to traffic and commerce. That same flood of 1927 practically carried away the little settlement of Radical. An old photograph shows the store and the post-office as little wooden islands in the stream. The road, which was then designated Missouri Highway 43, in those days ran to the west of what is now Kimberling City. It followed along down the bluffs, which are all now under the lake’s water, turned east and then looped south to cross the old bridge a good way upstream from the site of the present bridge. But, in the 1927 photo, all that shows is a little of the Radical rooftops, a bit of the road and a couple taller signs. The old photo was prophetic, for thirty years later in 1957, the White flooded once more, for the last time. The new dams tamed its flow, as they were intended to do, and put an end to the White’s violence and flooding. 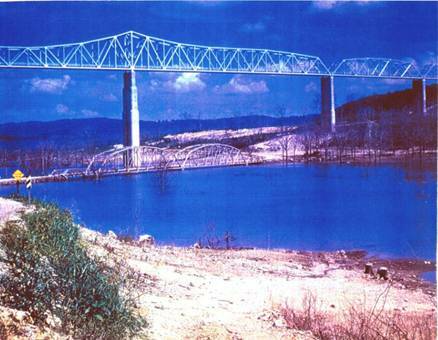 But in 1957 it buried the old bridge once again, putting it and Radical beneath its waters and the future waters of Table Rock Lake forever. Radical is now another of our interesting Stone County ghost towns. There exist a few old photographs which show both the 1927 Kimberling Bridge and the brand spanking new one that we use today. Many and many a picture has been painted and drawn of these two bridges seen together. They both still exist today, then new one above, and the ghost one below the waters of Table Rock Lake. The Corps contracted with a private firm to salvage out the old bridge. 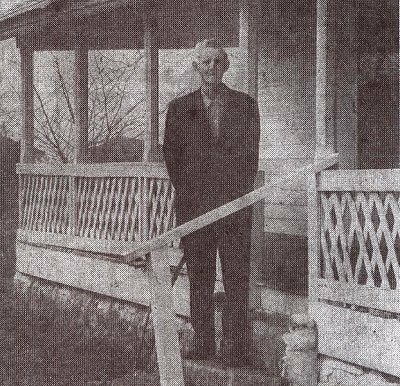 The original contractor, the father of an officer of the Stone County Bank, salvaged all that he wanted and then sub contracted the rest of the salvage to another man, another firm. It sees that this man partied up in Springfield and dallied there a bit too long. For the unexpected flood of 1957 backed up behind the new Table Rock Dam and buried the old bridge beneath the waters, forever. 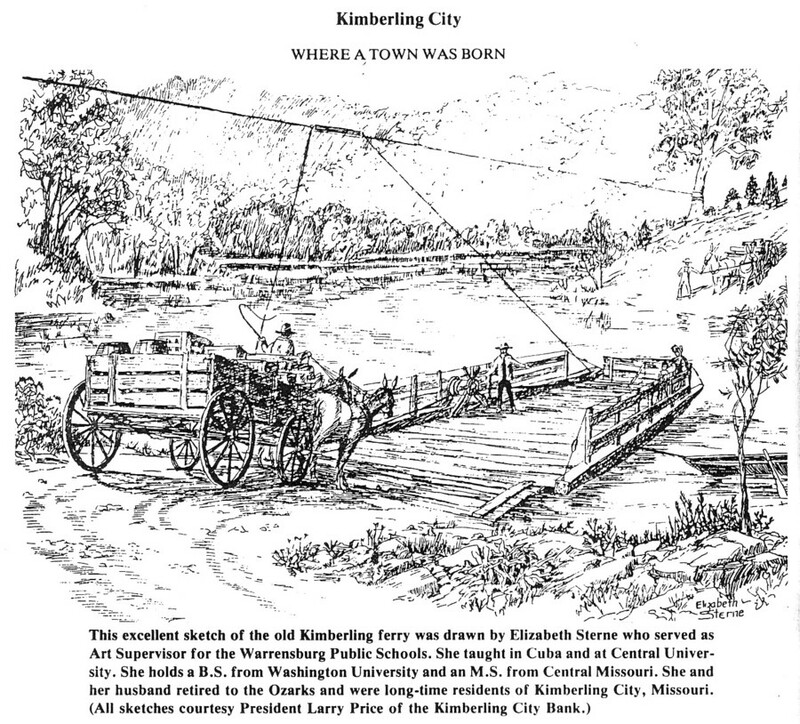 It is interesting to note here that the Mayberry/Kimberling Ferry was temporarily reintroduced to people traveling south in the Kimberling area just after the flood that buried Radical and the old Kimberling Bridge beneath the new waters of Table Rock Lake. Because the flood covered the existing bridge, and because the Highway Department didn’t have the new one quite finished and ready to go, the U. S. Army Corps of Engineers, who were building the dam and lake, were required to bring a huge military barge to the site and use it to once again ferry cars and people across the now flooded White River and the growing lake at the site of the old ferry crossing. Bob Connell was hired to run the barge/ferry until the new bridge was completed and open. Bob eventually bought the old barge from the Corps and converted it into a tour and party boat. Lots of jolly parties and dances were held on its decks on the new lake in following years. Fred Kimberling and his wife drove the first car across the brand spanking new Kimberling Bridge when it was opened to the public. They drove a 1950 Ford sedan. As a further footnote, Kimberling City finally got its own post office on January 2, 1963. In the spirit of his father William Kimberling, the first postmaster of Radical, Fred Kimberling bought the first stamp and his wife mailed the first letter postmarked from Kimberling City. As a sad footnote, a number of years after the Kimberlings passed on, vandals burned the historic 1885 home to the ground. So, that’s an important bit of our History that’s forever lost to the Kimberling City community and to the Ozarks. During the early 1900s, people flocked to Hootentown for popular riverside activities like swimming, surf bathing, and fishing. The only activity for women in the river involved jumping into the river and noodling catfish. Their clumsy Victorian and Edwardian style bathing costumes were often quite burdensome. Making it extremely hard to haul up a 30lb catfish. Women typically dressed in black, knee-length, puffed-sleeve wool dresses, often featuring a sailor collar, and worn over bloomers or drawers trimmed with ribbons and bows. 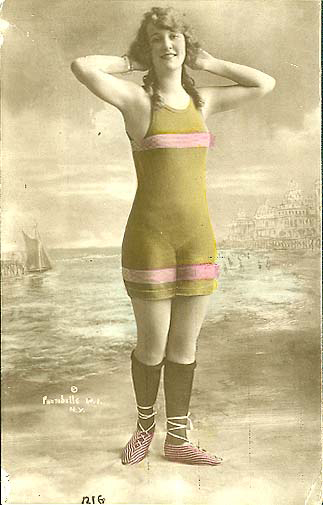 The bathing costume was typically accessorized with long black stockings, lace-up bathing slippers, and fancy caps. The men of the time always looked for farm girls with their own buggy and riverfront property. It was the heyday of Hootentown! Show your pride Hootentownians! I figured it might be time to start putting the word out about Hootentown and let those around the Ozarks know Hootentown is still alive and well. The shirt shows an image of the old steel bridge from around 1950 long before it was removed and replaced with today’s concrete structure. I tried to keep the costs down as far as I could possibly go so I chose this “Value” rated T. It’s an affordable alternative heavyweight t-shirt for the value conscious consumer. Pre-shrunk and made from 5.5 oz 100% heavyweight cotton. It also has double-needle stitched bottom and hems for extra durability. It only comes in white, if you want you can customize with your family name, your business name or whatever you wish to put on the reverse side of the shirt. You can also upgrade to a different shirt and go with other colors. I would suggest you keep it on a light color shirt so the printing looks correct. Order yours here! Here is a second shirt with the Famous Natural Arch. The second in the Hootentown-James River Series of shirts.